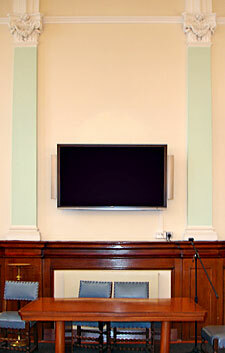 AV installation specialists, Sound Division, have recently supplied a state-of-the-art 61-inch NEC plasma screen into London's Jesuit Centre in Mount St, in the heart of London's Mayfair. The Mount St Jesuit Centre is both a teaching facility and a retreat where Christians may come and explore their faith via the many courses and activities that are run by the centre. The AV system, which also includes a DVD player and sky box and is connected into the existing PA, is designed to bring presentations to life and add a much-needed visual element to seminars and lectures. The room is also used for social activities, in particular the cinema club. Sound Division's David Graham reported that the installation was welcomed by the client. "The Jesuit Centre, like many other teaching organisations, has been offering visual presentations for a long time, but never yet of this quality and clarity," he noted. "It just so happens that this is the biggest plasma screen we've installed to date, and the client assures me that it's made a tremendous difference, particularly for participants of the cinema club. The quality of both sound and image is pin-sharp right to the back of the room. I'm told that they don't miss the old projector one bit!"